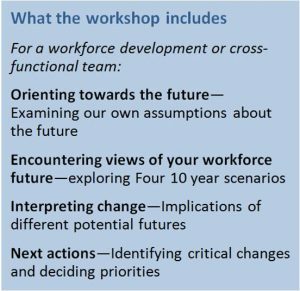 Exploring Your Future Workforce is a custom, facilitated scenario workshop for deepening insights on your future in this era of uncertainty. The workshop drives thinking on changing work requirements and the forces shaping your workforce in the next 10 years and beyond. Will AI and robotics replace even more workers? What will new leadership in U.S. politics mean to finding skills and to workforce requirements in the next decade? What do new entrants in the workforce bring and face as they become workers? One of our tools for mastering change is working through alternative future scenarios. Scenarios are compelling stories of change that can deliver insights about the future, and how we will experience it. We design critical, contrasting scenarios to help you understand what are the possible, probable, and desirable outcomes in your future. A key step is to identify what you can do today to make that preferred future a success. Organizational leaders risk being left behind as the shape of work, and the skills and talents needed in workers keep changing. With better foresight, leaders can anticipate change, identify emerging needs, and prepare their strategies to build, borrow, or buy the skills they need to face the future. Let us develop and schedule a custom workshop at your convenience and in alignment with your planning and strategy timing. Contact us at 202-270-0903 or jjarratt@leadingfuturists.biz. We focus on strengthening the foresight organizational leaders bring to workforce development and leadership. We have worked together for ten years building programs for organizations. Some of our recent foresight workshops and programs include: “Maine 2050” for the state Bureau of Human Resources; aging workforce workshops for the U.S. Chamber of Commerce; workforce scenarios for Disney; futures exploration for the American Nurses Association, and more, including scenario workshops for young leaders who are the future of the organization. We have extensive experience in researching and analyzing changes in work, worklife, technology, as well as values and attitudes in the workforce. Since the 1980s, we have designed and led workshops and processes for organizations exploring workforce change. Jarratt and Mahaffie co-authored FutureWork, an exploration of the broad forces of change shaping work. Katherine Green is an expert in organizational development and leadership. 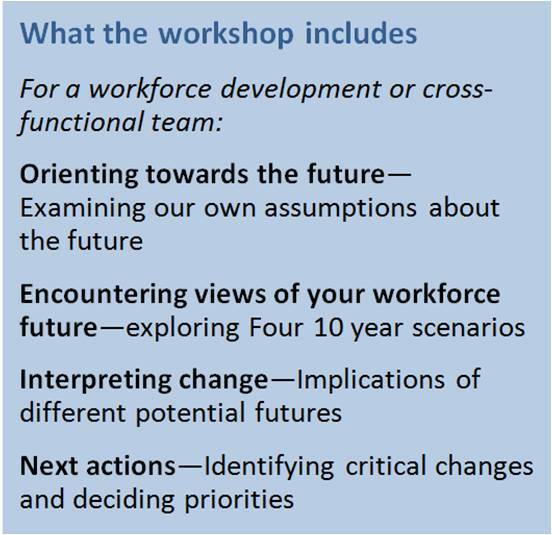 To download this pages as a pdf, click here: Workforce Futures Scenario WORKSHOP.